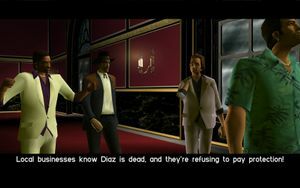 Tommy Vercetti, Lance Vance, Avery Carrington and Ken Rosenberg discussing Tommy's next move after he and Lance killed Ricardo Diaz. Intimidate shop fronts in the North Point Mall. Shakedown is a mission in Grand Theft Auto: Vice City which the protagonist Tommy Vercetti does independently in the Vercetti Estate in Starfish Island, Vice City. After taking over Diaz's mansion, Tommy discusses with Lance Vance, Ken Rosenberg, and Avery Carrington on what to do next. Lance tells Tommy that some stores are refusing to pay protection after knowing Diaz's death. Tommy heads to the North Point Mall to do a hit and run on the shop fronts to scare them into paying protection. As he destroys the windows of the shops, Tommy gets increasing attention from the police. Tommy manages to smash all the windows of five shops within five minutes. The rewards for completing this mission is $2,000, the .308 Sniper is available to buy at the Downtown Ammu-Nation store, and assets can now be purchased by the player. The missions Bar Brawl and Check Out at the Check In (if Autocide has also been completed) are unlocked. Sonny Forelli: Tommy, remember me? Sonny Forelli: That's right, Sonny. We're old friends, you never write me, you never call. Don't you want to be friends no more? Tommy Vercetti: I've been busy trying to sort things out. You didn't give me a lot of support down here, Sonny. Sonny Forelli: Oh, my fault is it? Well, I've heard you been busy all right. Busy killing drugs barons. Busy taking over. Don't forget about us, Tommy, 'cause I can assure you, I ain't forgotten about you. Avery Carrington: Howdy son, just thought I'd ring you up and give you some advice. Tommy Vercetti: Hey, Avery, what's eating you ? Avery Carrington: There's a lot of opportunity in this town if you own the right real estate, you catch my drift ? Avery Carrington: All I'm saying is keep your eyes open and you might find the perfect business opportunity. I'll catch y'later. On the iOS and Android versions of GTA Vice City, this mission becomes a lot easier. This time, you only have to destroy 10 shop windows instead of all shop windows. As a result, the mission ends with a 2-star wanted level instead of a 5-star wanted level. Tommy Vercetti about to enter the North Point Mall. Tommy Vercetti shooting at the windows of the Tarbrush Café store. Tommy Vercetti shooting at the windows of the Vinyl Countdown store. Tommy Vercetti shooting at the windows of a jewellery store. The game showing the player that assets, in this case the Malibu Club, are available for purchase. This page was last modified on 17 May 2015, at 00:08.